The XXl printer needs two gcode files; one for the master and one for the slave. The purpose of the program is to take a gcode file from an object as input, and create 2 new gcode files; one for the master and one for the slave printer. 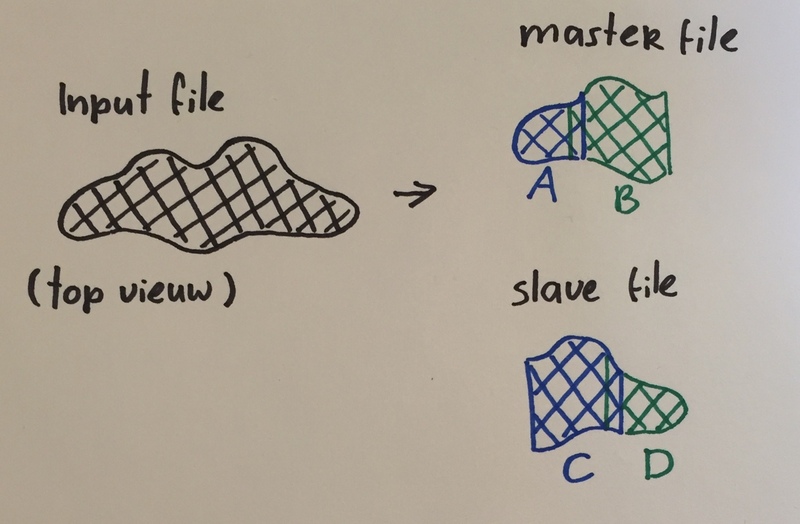 It does so by splitting the main object in 4 smaller objects: A, B, C and D. Then it writes A and B to the master file and C and D to the slave file. The program also creates a small overlap between sublayers, so that the sublayers are connected and the final print looks like one object again. First the program checks if there are x and y values in the line. Because there are cases like the example below, where nothing needs to be done. Then it takes the current x, y and e values. And it compares them with the previously read x, y and e values. For each sublayer (A,B,C,D) it checks if there needs to be made a cut. 1: both points are inside the cut lines. So the coordinates don’t need to be changed. 2: both points are outside the cut lines. So the coordinates can be thrown away. This is outside of the sublayer we want to make. 3: one point is to the left of a cutting line, and the other to the right. Here there needs to be made a cut! This means a new point will be inserted on the cutting line. 4: one point is to the left of the left cut line and one point is to the right of the right cut line. Here two new points need to be made. Because even though both points are outside of the printing line, the line in between still needs to be printed. The program cuts an object with x xoordinates. 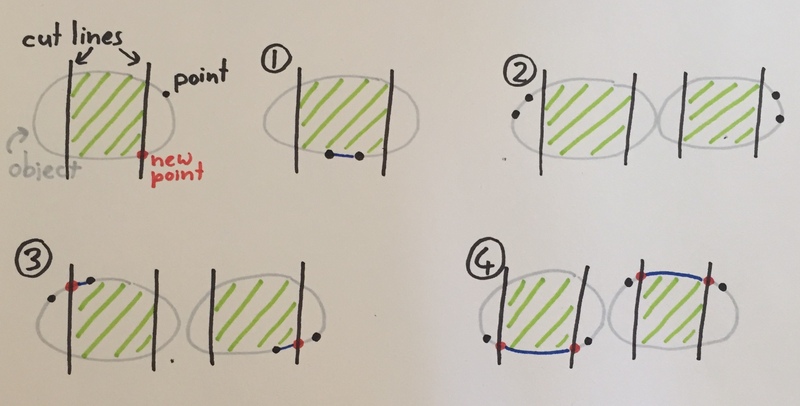 We know the current and previous x and y coordinates and we know the x coordinate of the cutting point. 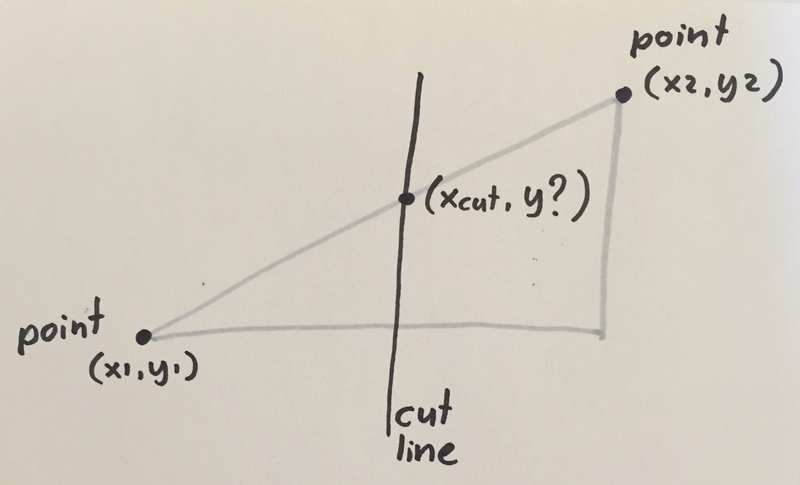 For the cut we want to know the y coordinate that belongs to the x xoordinate of the cut line. For this we use the property of a slope. The program writes down the new coordinates.